What I miss these days is baking. I'm so looking forward to baking fresh loaves of bread, cookies, cakes, etc once the weather cools a bit. But I recently got to the point where I couldn't hold off anymore and turned the knob to preheat my oven. 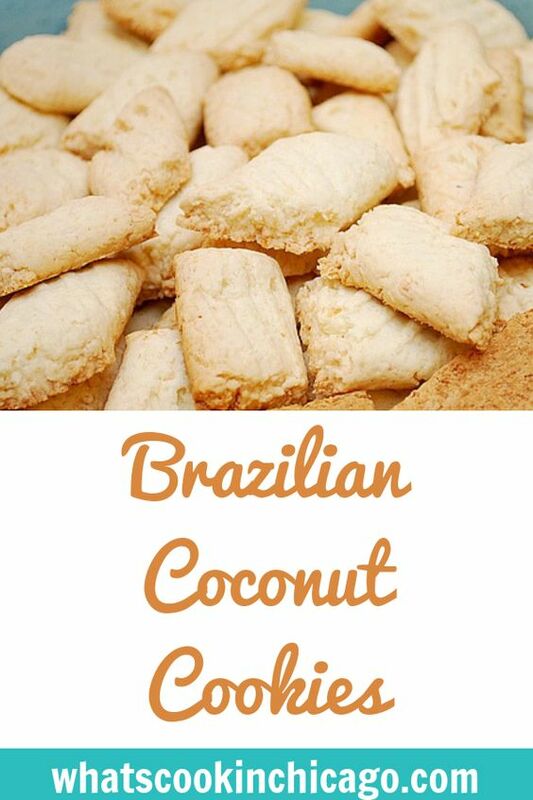 I had cookies on the brain and wanted to try my hand at baking these Brazilian Coconut Cookies after enjoying some Brazilian cuisine not too long ago. These cookies are light, subtly sweet and one that will have coconut lovers wanting more. Who knew that 6 common ingredients could give you a sweet taste of South America? If I had to describe these cookies, they're almost like tea biscuits. In fact, I enjoyed them the most with a nice glass of iced tea. They'll go just as well with hot tea and coffee too. I will say that the trickiest part of this recipe is making sure the sugar syrup is at the right temperature and consistency. You may be tempted to stir or even jiggle the saucepan as the sugar and water cook away but don't! Step away and let it do it's magic on the stovetop. Once you have the sugar syrup, flour and eggs yolks are combined and tempered with the syrup before incorporating everything together. Grated coconut and vanilla extract is introduced to create a nice cookie dough. It will be a bit warm to handle at first so allow the time for it to cool so you can shape them. I shaped them into rectangles that were then cut in half on a diagonal. Traditional recipes call for shaping the dough into a ball and flattened, so feel free to make them as round cookies if you wish. While they bake, definitely start preparing a cup of coffee, hot tea or a cool glass of iced tea. You'll need it to fully enjoy these cookies! In a heavy 2 to 3-qt saucepan, combine the sugar and water and cook over moderate heat, stirring only until the sugar dissolves. Cook without touching or stirring until the syrup reaches a temperature of 230 degrees on a candy thermometer, or possibly a small amount dropped into ice water immediately hardens into a thread. Meanwhile, in a small bowl, combine the egg yolks and flour together until well blended, then add in 2 tablespoons of warm syrup, stirring constantly to temper. Slowly pour the mixture into the syrup in the saucepan, stirring constantly. Add in the coconut and simmer over low heat, stirring, till the mix becomes very thick and stiff. Don't allow the mix to come to a boil at any point. Remove the pan from the heat, stir in the vanilla, and let the mixture cool to room temperature. Preheat the oven to 375 degrees. Shape the cookie mixture a tablespoon at a time, into 2 inch long rectangles and then cut in half on a diagonal. Arrange the pieces 1 inch apart on a buttered cookie sheet. Using the tines of a fork, lightly press the tines onto the top of each cookie and bake in the center of the oven for 15 min or until the cookies are a delicate golden color but not browned. Remove from oven and cool before serving. Makes about 40 cookies. Yum-these look like they would really be good with tea. I have bookmarked this recipe, thanks so much for sharing! These cookies look absolutely delightful..so light and delicate. Wow! These cookies indeed look like perfect with a cup of coffee! I love anything with coconut so I definitely gonna love this! Bookmarked! 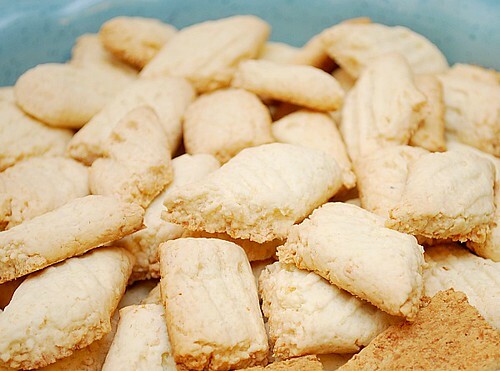 These look like the perfect cookie to enjoy with an afternoon cup of coffee or tea. Only problem would be stopping at one or two! These look great--just enough to satisfy a sweet craving but not so much that I'd feel guilty afterward!